MinQuest Limited (ASX:MNQ) is a mineral exploration and project development company whose objective is to create wealth for shareholders through the acquisition of pre-production copper, copper-gold and multi-commodity base metal projects, completing exploration, scoping and feasibility studies and then capturing value for shareholders. 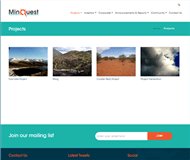 MinQuest pre-dominantly focus’s its exploration and project assessment activities on pre-production copper and copper-gold projects, which contain defined JORC compliant Mineral Resources. Through the application of leading edge geophysical techniques and new geological thinking, MinQuest aims to expand the currently defined Mineral Resources on its projects such that Scoping and Feasibility studies indicate that the projects will be economically viable as stand alone operations. MinQuest will aim to maintain a portfolio of projects at differing levels of assessment, maximising news flow to the stock market. While the majority of MinQuest’s project portfolio will be pre-production projects, the portfolio will contain one or two greenfield copper and copper-gold projects with the potential of deliver truly world-class mineral discoveries. A small proportion of the exploration budget will be spent each year on testing a quality target on the greenfield projects. MinQuest maintains an active project generation and assessment program, continually assessing new project opportunities in copper and copper-gold. 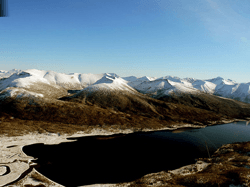 Since mid-2014 MinQuest has focused its activities in the Yukon Territory in Canada and in Australia, looking to capitalise on project opportunities in poorly explored geological terranes in these low sovereign risk countries. 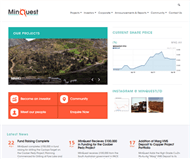 MinQuest conducts its exploration and project assessment activities using socially and environmentally responsible methods. MinQuest aims to develop mutually beneficial relationships with all project stakeholders, particularly with the indigenous people’s in proximity to the companies projects. 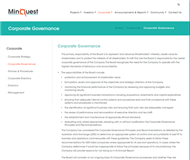 MinQuest is headquartered in Brisbane, Australia and trades on the Australian Stock Exchange under the code MNQ. The Fyre Lake property is situated immediately east of Fire Lake, known as Tsa K’on Mena by the local Dena Community. It is located in the Finlayson Lake area of the Watson Lake Mining District, southeastern Yukon Territory, Canada (Map FL-002). The Fyre Lake Project consists of the Kona Deposit, a Volcanic Hosted Massive Sulphide (VHMS) deposit of late Devonian age. The Kona Deposit has been drill tested by 115 holes totaling 22,663m of diamond drilling. Most of this drilling was conducted along a 1,500-metre section from near its surface exposure in Kona Creek towards FL-005 Fyre Lake Historic Drillingthe southeast at depth. The drill-tested mineralization occurs within an area approximately 1,500 m long by 250 m wide. The deposit itself consists of two, parallel zones of mineralization known as Kona East and Kona West, separated by an inferred and apparent normal sense growth fault (Map FL-005). The recent VTEM survey identified electromagnetics (‘EM”) and magnetic anomalies on the North-West Ridge, directly along strike from the currently defined Kona Mineral Resource. MinQuest also recently completed a geological reinterpretation of the Kona Mineral Resource. This reinterpretation showed that the Kona Deposit has been eroded away in the valley floor of the Kona Cirque, at the current northern limit of the Kona Mineral Resource. However, projecting the deposit along strike to the north-west shows it that has the potential to also exists on the North-West Ridge, coincident with the EM and Magnetic Anomalies (Map FL-014). This area has not been drill tested in the past and MinQuest plans to test this target during the northern hemisphere summer of 2015. If the resource exists as shown as the Exploration Target in Map FL-014, it has the potential to add approximately 7.0 Mt to 8.0 Mt at similar grades to the currently defined resource on the other side of the valley, which are the tonnes required to sustain a stand alone operation. The estimation of the Exploration Target is based upon extrapolating the currently defined Kona Mineral Resource a further 1150-1250mm further north-west following the trend of magnetic and electromagnetic anomalies, directly associated with the Kona mineralisation, which extend 1150-1250m beyond the currently defined limit of the Kona Mineral Resource. The Exploration Target is conceptual in nature and there has been insufficient exploration to date to define a Mineral Resource. It is uncertain if further exploration will result in the determination of a Mineral Resource. The western lens of the Kona Deposit appears to be thickening at depth. One of the thickest and highest grade intersections recorded to date on the Fyre Lake Project was in hole 96-065, the most south-easterly hole to intersect the western lens of the Kona deposit. This intersection was 31.3m @ 2.3% Cu, 0.07% Co, 0.51g/t Au including 7m @ 6.0% Cu, 0.05% Co, 0.68g/t Au. The eastern lens of the Kona deposit may also thicken at depth in a similar way to the western lens. The eastern lens has two high grade sections open at depth, with the most south-easterly hole being 97-114 (Map FL-013). These thickened lenses of high-grade mineralisation represent very attractive exploration targets and cold potentially add significant tonnes to the currently defined mineral resource. The Kona Deposit consists of two, parallel lenses referred to as Kona East and Kona West. These two lenses are separated from each other by a step fault, which was likely active during deposition of the Kona copper-gold mineralisation. Bounding the west side of the Kona western lens and the east side of the Kona eastern lens are two additional step-faults (Map FL-007). Very limited drilling has occurred beyond the faults bounding the mineralisation to the east and the west. These untested areas of potential extensions to the western and eastern lens of the Kona deposit, exhibit electromagnetic and magnetic anomalies similar to the electromagnetic and magnetic anomalies directly associated with the known Kona deposit (Map FL-013). If these anomalies are due to copper-gold mineralisation they would constitute entirely new lenses of mineralisation and potentially add significantly to the current Kona Mineral Resource. The Kona East zone mineralization is 100 to 150 m wide, and consists of two massive to banded sulphide-bearing horizons (i.e. Upper and Lower Kona East) separated by 40 to 70 metres of chlorite schist (Map FL-012). These two horizons vary in thickness from 3m up to 16m and generally thickening slightly with depth. These horizons consist mainly of pyrite with lesser pyrrhotite and chalcopyrite; they also contain local lenses of massive magnetite and minor sphalerite. The Kona West zone is inferred to be 75 to 125 m wide. The thickness of the mineralized horizon varies across this width from about 44m in the east to 2m at the western margin (Map FL-012). The Kona West mineralization generally thickens significantly with depth and towards the eastern margin. It includes mineralization that changes laterally from magnetite, pyrite and chalcopyrite in a siliceous matrix, through massive pyrite and lesser chalcopyrite, to massive pyrrhotite with minor pyrite and chalcopyrite. This mineralization occurs close to a stratigraphic contact between chlorite schist and overlying carbonaceous phyllite. The property is underlain by the Devonian to Mississippian Grass Lakes succession; the oldest stratigraphy in the district belonging to the Yukon-Tanana Terrane (Murphy and Piercey, 1999b). It is comprised, in part, of a basal unit of non-carbonaceous, metasedimentary rocks and marble. This basal unit is overlain by rocks of the Fire Lake metavolcanic unit (~ 365-360 Ma) which hosts the Kona volcanogenic massive sulphide deposit and is comprised of mafic metavolcanic and metaintrusive rocks, and lesser felsic metavolcanic rocks, carbonaceous phyllite and quartzite, and marble. The Fire Lake metavolcanic unit is stratigraphically overlain by the Kudz Ze Kayah felsic metavolcanic unit (~360 Ma). This unit consists dominantly of felsic metavolcanic and carbonaceous metasedimentary rocks with lesser mafic metavolcanic and metaintrusive rocks, and felsic metaintrusive rocks. The Marg project is located in the central Yukon, approximately 40km east of Keno City (MG-001). The property consists of 402 quartz mining claims covering over 8400 hectares adjacent to the Category A land of the Na-cho Nyak Dun First Nation (MG-002 ). The Marg project consists of the main Marg deposit, a volcanogenic hosted massive sulphide (VHMS) deposit hosted in the metasedimentary and metavolcanic rocks of the Devono-Mississipian Earn Group. The project also contains an additional 15km long belt of the same felsic metavolcanic and metasedimentary rocks that host the Marg Deposit. Within this belt, soil geochemical sampling has outlined several very promising anomalies that have yet to be properly drill tested (MG-005, MG-006 and MG-007). The Marg deposit consists of three continuous units that contain the majority of the total defined Mineral Resource. The deposit is strongly attenuated and contains an additional eight smaller stacked sulphide lenses. The deposit can be traced in the sub-surface for over 1400m along strike (MG-003). The deposit is open in both directions along strike and at depth (MG-004). The main economic mineral species are chalcopyrite, sphalerite and galena associated with pyrite occurring as massive to semi-massive lenses up to 20m thick (averaging 3m to 4m). A simple evaluation of the deposit in terms of the mining potential shows that the higher grade resource is associated with the thicker zones and tends to be clustered in the central area of the deposit, plunging to the east. Of the 11.7Mt (at a 0.5% Cu cut-off), approximately 8.0Mt are thicker than 3.5m true thickness at grades greater than 2.0% CuEq. The deposit also dips from 45 degree to 70 degrees. These factors present a very positive scenario for the development of mining activities in the future. MinQuest aims to explore the Marg project by drilling at depth and along strike with the intention to increase the size of the JORC compliant Mineral Resources at the Marg deposit. Significant exploration potential remains along the 15km strike length of favourable stratigraphy held within the extent of the projects tenements. The Jane Zone in particular represents a very attractive geochemical anomaly with mapping indicating the Marg VMS bearing horizons exists in the area (MG-005). MinQuest will test the Jane target, and other targets with the aim to add significantly to the currently defined Mineral Resource within a short distance from the main project site (<20km). 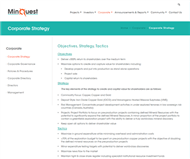 MinQuest also plans to initiate environmental and engineering studies for the purpose of updating a Scoping Study. The metallurgical information on the project is limited and work is required to confirm the potential recovery of the various economic elements. With this information, MinQuest will be able to update the Scoping Study and determine if a full Feasibility Study on the project is warranted. The central region of the Yukon Territory, where the Marg is located, has fairly well developed infrastructure. 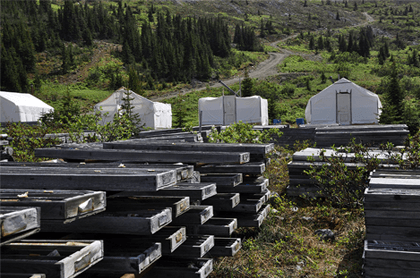 The Bellekeno Silver Mine, held by Alexco Resources, is located 40km to the west and was operational until late 2013. Currently, their processing plant is on care and maintenance while the company develops further resources and waits for a recovery in the silver price. Recently, the Yukon government has approved the upgrade of the existing transmission line to Keno City from 68kV to a 138kV line. This upgrade is expected to be completed by the end of 2018. From Keno City and the Bellekeno Mine, the Marg project can be accessed by a 40km winter road. The exploration camp is still in place on the project and the majority of the infrastructure is ready for the re-commencement of exploration. A small landing strip for light planes exists on the project and several larger pieces of construction equipment are also on site. The Coober Pedy project consists of three tenements located near the town of Coober Pedy, South Australia. The focus of exploration has been the Cyclops target, located at the border between EL4891 and EL4892, approximately 150km South-West of Coober Pedy. The Cyclops Target was generated from a series of geophysical anomalies within the Gawler Craton, South Australia. Similar to Prominent Hill, the Cyclops Target consists of a magnetic anomaly offset slightly from a density anomaly. This geophysical signature sits on a deep seated, Craton tapping major structure, the Karari Shear. The main target at Cyclops will be the gravity anomaly looking for a Prominent Hill style hematite breccia complex with Cu +/- Au. MinQuest plans to put the first drill hole into the Cyclops Target in 2015. An IOCG deposit equivalent in size to Prominent Hill emplaced at time of Hiltaba Event (~1595-1575 Ma). Structurally controlled, older re-activated faults in Archean basement or splays/break-back thrusting of the Karari Shear Zone (active ~1580-1540 Ma, but possibly as early as 1680 Ma). Related to a dynamic environment at the paleo-continental margin, with variable stress regimes and variable fluid sources (mixing). Associated with important ENE and NW-NNW structures linked to IOCG formation in the Gawler Craton. The General Overview, Services, Products and Projects information for this profile was last edited on 26 Apr 2016.